Multiflora rose (Rosa multiflora) is probably the most cursed-at plant at the conservation area. Although it produces attractive sweet-smelling masses of flowers in the summer and bunches of bright red rose-hips in the winter, this fast growing shrub also produces large, stiff, hooked thorns that have done severe damage to many a hiker’s skin and clothing. It was originally brought to North America as a root-stock for ornamental roses, and then promoted as a conservation plant, which could limit erosion and act as as a “living fence” that could contain livestock while also providing wildlife habitat. As with a number of other exotic plants touted for their living-fence worthiness, multiflora rose has been found to be a serious weed in much of North America. The seeds are eaten by birds and rodents, who enhance the seeds’ germination potential in their digestive tracts before releasing them far and wide. Stems may grow up to 15 feet long, and will either be supported by a nearby tree or arch back to the ground, where they will re-root upon contact with the soil. Multiflora rose can be distinguished from native roses by its clusters of white flowers, as compared to the single pink flowers of this area’s native roses. Multiflora rose also has fringed, hair-like stipules at leaf bases, as can be seen in several of these pictures. 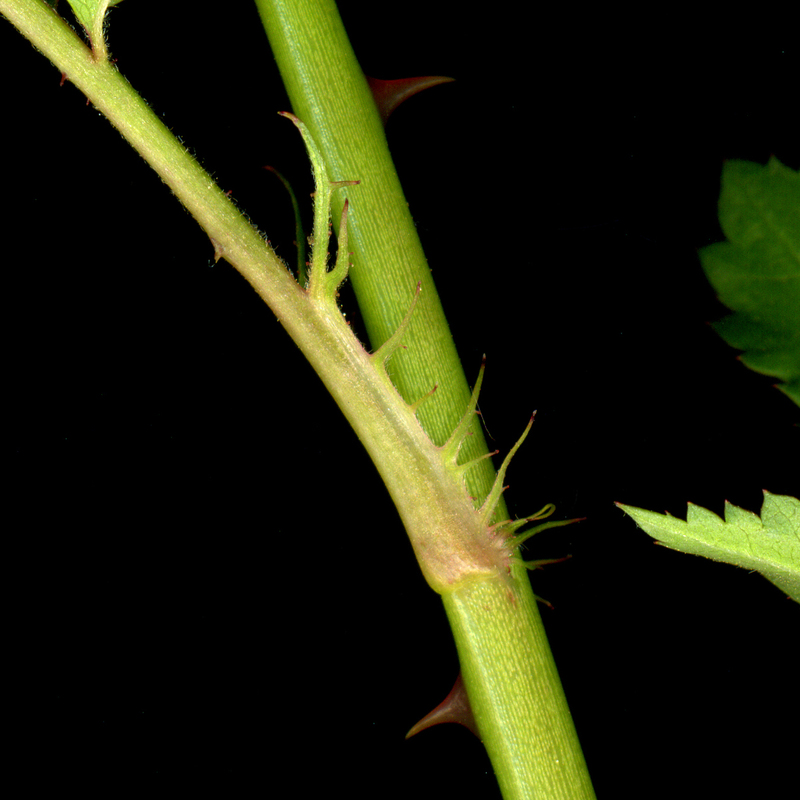 The thorns, which curve back toward the base of the stems also help distinguish multiflora rose from native roses.